If somebody told me in January that I'd do an ironman in October I'd of laughed. If they would have told me I'd do another ironman 5 weeks after that I'd of called the men in white coats to take that person away. And while some might think I methodically planned the season, I'm sorry I'm not that smart. So here I stood, Tempe beach Park scottsdale arizona. One question, why? To improve and execute a better race than I did in Barcelona. More importantly I got a green light from home. We all have the answers before and after the race but during a race is what matters. I was extremely pleased with Barcelona but there was some regrets in decisions I made and a few what ifs. Going to arizona would be a challenge. I flew out on Thursday and raced Sunday. Not ideal but nothing to worry about. Owen Martin was there and the company was great for both of us. We had different goals with Owen wanting to get his Kona ticket and I... Well what did I want exactly. A faster time maybe.. There I said it, I was to chase the clock. 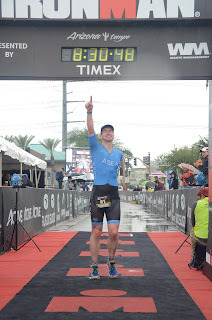 I speak too often about not racing for time and race for position but Arizona I felt I could achieve 8:20's status. That was my target. I felt I could swim sub 1 hour and bike relatively the same in Barcelona and hopefully around 3 hours for the run. I raced in the professional category again. I seem to have a knack of picking the races where the field is stacked with talent. Any one of 5/6 could win(I wasnt one of those!!!) and then about 20/30 lads jostling for first page on the result sheet. Top 20 would be a realistic goal I felt. Ironman is very much an eventful day and you're tossed curve ball after curve ball. My first came as we entered the water. I says to the Dutch guy I know. "It's a little dark".. He says.." that's why I wear no goggles ".. Oh dear. I had a brand new pair of roka mirrored lense goggles and when I put them on it was like looking into a black hole. But there was no way I was throwing them away, they were nearly 50 quid!. I had to use my instinct and follow feet and hope they went straight. Trouble is the I held onto those feet for all of 10 meters. The sun did rise before the turnaround but I wasn't on it at all. My arms were so tired at the first turnaround. About 10 women swam clean over me.. I've never been abused by so many women in such a short space of time. 1hrs 2 mins. Ah well.. No worse than Barcelona! . I made the biggest rookie mistake here and I didnt realise until Owen pointed it out to me the other day. He asked did I wear my speed suit over my shoulders under my wetsuit. Just as he said it it registered.. 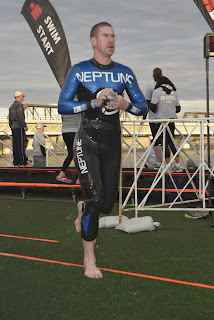 The speed suit is really tight and I basically fought extra resistance for the entire swim. Nothing to do with the speedsuit, just my decision to not wear it around my waist. I got moving slower in the bike. I was seeing big numbers early on in Barcelona but my legs were singing so I went with it. But to sing for over 4 hrs is difficult and that's what I needed to fix. Plan was to get my heart rate in the 140's. I never seem to Roll into the next race with the same set up. 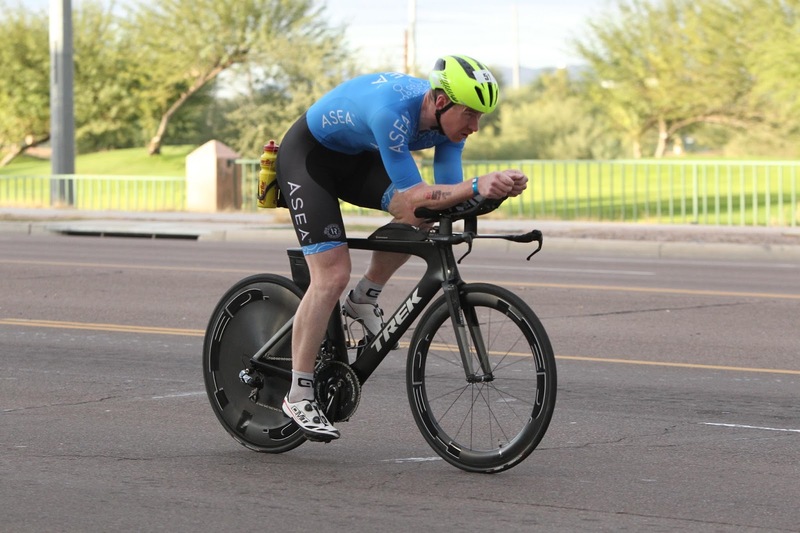 For this race I changed wheels, tires, tire pressure, bottle placement, helmet,shoes, trisuit... Basically everything. 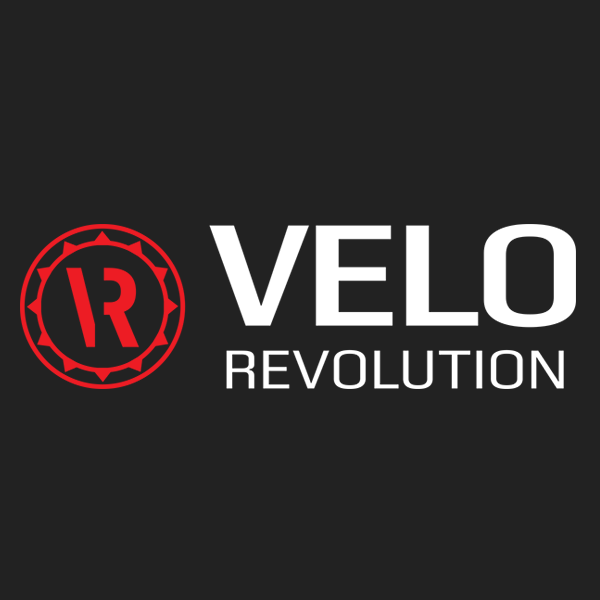 I rode 10 watts less than Barcelona for the first couple of hours . I wanted to be more consistent.. The urge to push was there but I stayed in control and saw myself in around 30th place.. Right, time to go to work. The bike felt great, I was rolling smooth and felt happy with the few changes. After the race Bob at cyclepowermeters.com gave me a call and took my data from the bike leg. He did this also for Barca. He calculated my cda (aerodynamics).. came in at .25. 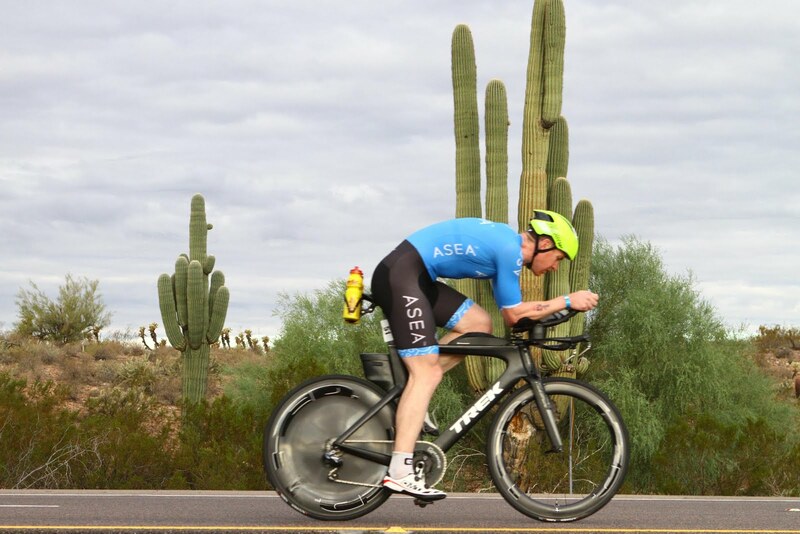 This is why I changed set up because my CDA for barcelona was .32.. Too much he said , I needed to be in and around .25. not too aero but aero enough to enable a healthy run!. I knew I was more aero and I got the pressure in my tires just right. It felt so smooth. The distance can always get you and I'll admit I had a bad patch around 85 mile.. It came out of nowhere, I needed to pee really bad and I had difficulty. I also felt at this point a little hungry and it wasn't a good sign. The weather wasnt hot, rather cold with rain hitting us at this point. I needed more calories because in the cold your body burns more calories. Always important to eat more. I had to make a decision, at the 90 mile turnaround I basically stopped to make sure I got a few bananas and liquid from the aid station, I then stood on the pedals and thought... Big flowy fountains, big flowy fountains... With difficulty the fountain arrived. Such relief. Up until that point for the 40km splits I rode. 56mins,55 mins, 54 mins, the 4th was 60 mins. That episode cost me 5 mins but in hindsight it would've cost me the race had I not dealt with it. I was happy that I picked it up for the final 10 mile and finished strong. I knew I was well up at this stage. Running in the rain.. in the dessert!! I did not want to run but who does after 112 mile on the bike but on exiting t2 the winner of Barcelona tore out like a man possessed. I on the other hand looked like I was out for a Sunday run. And that's exactly what my plan was. Again learning from Barcelona I wanted to build into it and not let my legs lead me into a false sense of what's really going on. It wasn't great but somehow I was moving OK. I changed my running technique because of my calf issue in Barcelona. Instead of being on my toes I slapped the ground more. There were aid stations at every mile and I fueled at them all bar 3 I'd say. This was leading from not enough calories on the bike. Way too much time wasted. I also needed to pee again and I haven't quite mastered the 'running pee', I had to stop for this one!! But the clock doesn't stop...It rained for the duration of the run and it was great. Keeping the core temperature down is essential for a big guy like me and even though I do perform well in the heat Ill take the rain any day of the week. I knew I didn't get the nutrition right but I had to focus on the job in hand. I felt strong and not terribly fast but I started to repass guys that flew past me early on which gave me a lift. We had special needs bags and I really needed it. 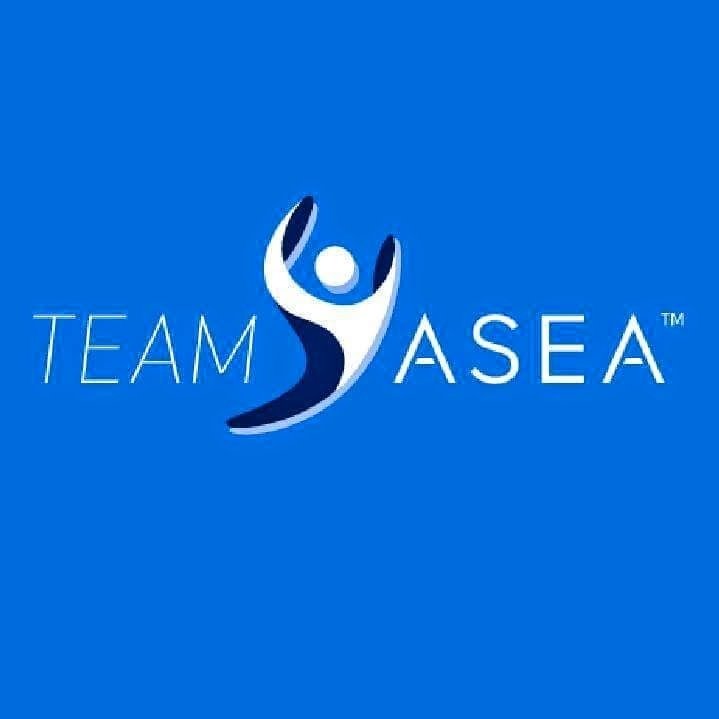 I had a banana and about 16oz of Asea in it.. As I Passed one guy he was ready to quit and his Mrs shouted he was in 8th place.. Not any more I says!!. Huge boost I got from that.. Jaysus I'm in the money here I thought.. As the finish approached I was gaining on 2 others but ran out of road. Ironman doesn't play out inside 4/5 hours and your day is never done until you hear Mike Reilly announce 'You are an Ironman' and it's good to get that reminder again. Having two very bad episodes could have cost me and had I let that filter into my head and not used experience Owen Martin could've been listening to me making all the excuses under the sun Sunday night. Ironman doesn't go smooth, certainly didnt for Owen either but he (and me) got the job done. See out the day and reflect, good or bad. 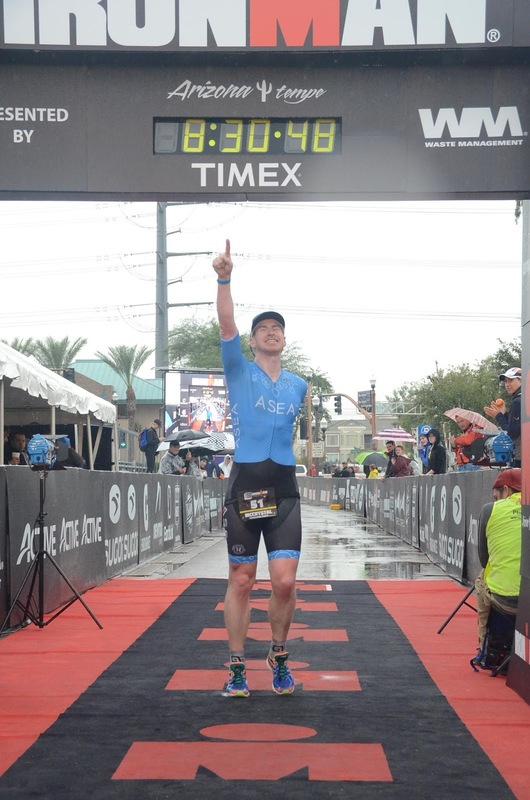 Owen won his age group, a feat he achieved last year. A true professional performance from him! Getting back to my 8th place finish... I rang Karen shortly after.. Both of use elated... "8th..wtf" ..."eh no.. 12th"... Are you sure I said. Pretty sure Karen said back... Ah bollix, here's me thinking I crept into top 10 and earned some coin to bring home.Well... I'll 12th any day of the week. And if I was in this game for money I'd be broke a long time ago.. I took over ten minutes off Barcelona , not quite 8'20s status but 8:30 will do just fine! 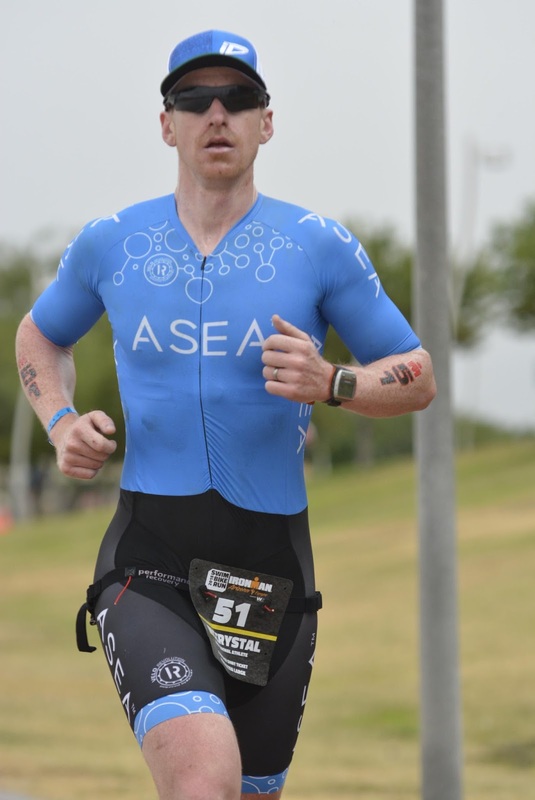 Whats next for Bryan McCrystal?? Cake, buns and Christmas. 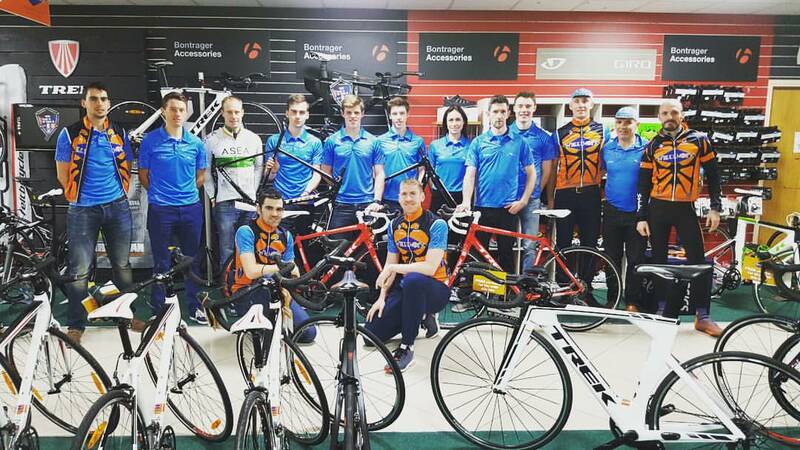 Biggest thanks of all to a great bunch of Lads in Team Asea. We had some good and bad days but always met the next challenge head on. Special mention to the Honey badger himself Brendan Grimes. He was at every race possible working tirelessly to ensure us guys were in the best possible shape.